Our first night in Greece was a simple one. 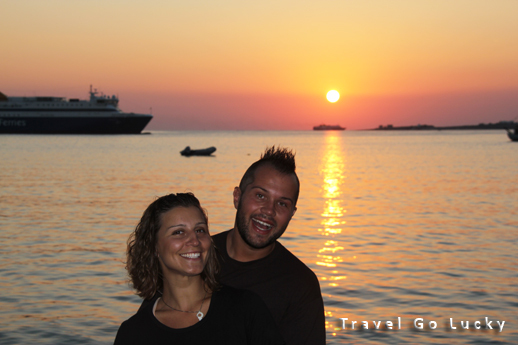 We wanted to get some good rest and be ready for our early morning departure to our first island, Paros. We settled into our hotel room and then went on an adventure to find some local snacks. Luckily, just across the street was a little market that offered some freshly made bread & of course… Feta cheese made in the very establishment it was purchased in. We ate our snacks, had some cocktails, and got ready for our 5:30 am start the next day. 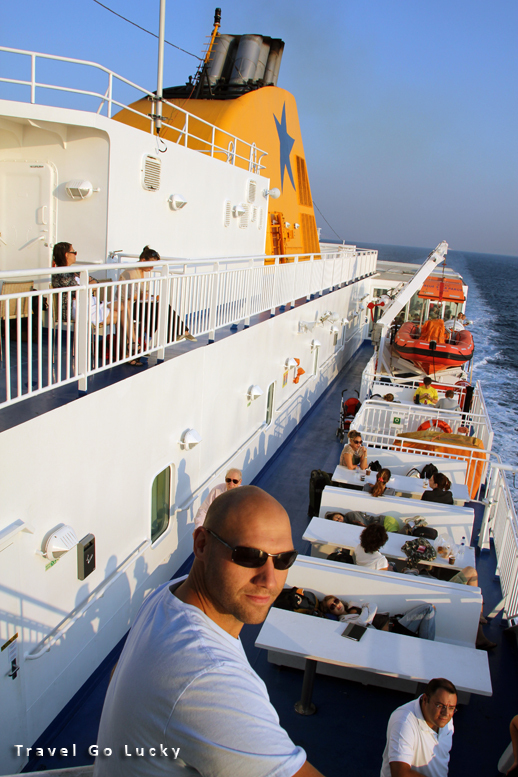 Our first encounter with the ferry boats of the Greek Isles was a pleasant surprise, as the ferry boats were more like mini cruise ships than our idea of a “ferry”. We posted up on the top deck and watched the mainland vanish in the distance. 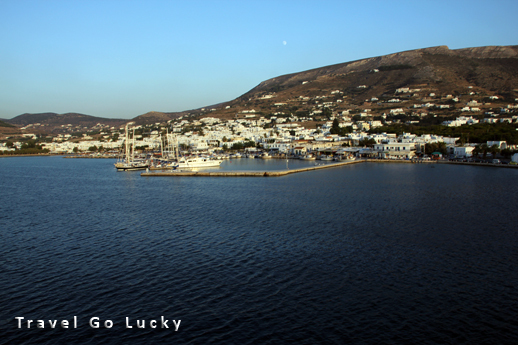 We were on our way to Paros, a laid-back, centrally located island in the Cycladic islands of Greece. When we first arrived to Paros we were taken back by how the ocean water was second to none, so crystal clear blue that words can’t describe it. Upon departing the ferry and entering the port I received my first encounter with the onslaught of locals trying to earn your business as a guest to their hotel. Since Adam and Dana were pros at interacting with these kind of folks by now, they were able to get us through the crowd and eventually work out a good deal at a locally owned hotel. The first sight of amazement for me was the amount of marble used within the town’s construction. It is EVERYWHERE, even the sidewalk gutters are lined with it! Once we got settled into our room, Adam decided he needed to get re-mohawked. Let’s just say, he is no hair-stylist…. the next hour involved a beard trimmer whose battery ran out and a trip to the local barber. Our next mission was wine… cheap, delicious wine. Located a few blocks away was a little market without a name, that we later titled “Grandpa’s Store” due to the elderly gentleman that sat behind the cash register. To our satisfaction, Grandpa’s Store sold $3 plastic, 1.5L bottles of wine that could compete with any $20 bottle in the US. With wine and towels in hand we walked 150yds to the beach. The day was clear and still, perfect for a little R&R. We drank some wine and rested our eyes on the somewhat rocky but comfortable sand. After the first bead of sweat began to form on our brows we headed for the sea, crisp, refreshing… perfect! I got adventurous and began harvesting sea urchins with the idea that I should start a business utilizing the islands bountiful supply of them for export. Adam quickly brought me back to reality with some sort of smart-aleck remark. After our time in the sun, we were hungry…. hungry for some good Greek street food. And that is when it all started… a craving for Gyros that could never be satisfied. With every swipe of the blade through the rotating, fat oozing hunk of meat to the perfect placement of the onions, lettuce, tomato and tzatsiki sauce… our mouths began to water. To our relief this common street food was very affordable and available everywhere. 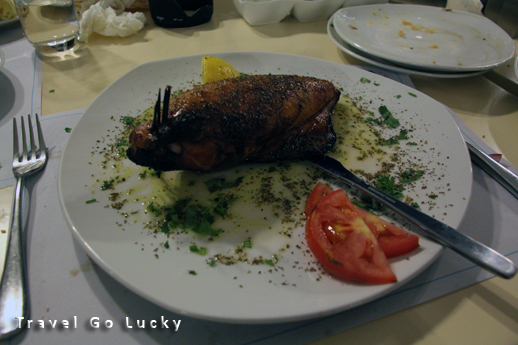 Not a day went by for the rest of our time in Greece, that at least one of these was not consumed. We then began planning the rest our journey through the islands and enjoyed the use of the internet to touch base with 21st century. A little more rest time… after all, you have to honor the siesta when in Greece! We talked to the hotel staff in hope of getting some insight into a good restaurant to get some of the fresh local seafood we saw being tossed off the fishing boats earlier that day. Good thing, we did this because we found a little place of heaven on earth for Adam. The name was Korallis. 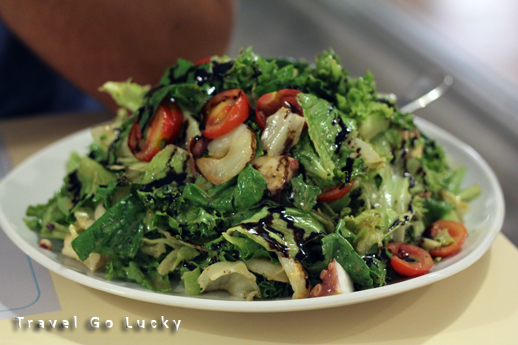 We ordered the recommended Korallis salad, which consisted of mounds of marinated octopus, smoked salmon, shrimp and field greens. This salad was HUGE and soooo amazing that I ordered it by myself as a dinner entrée for our next two visits. Adam also fell in love; his pleasure was a seafood and cheese stuffed, grilled octopus that was a flavor explosion to say the least. Also enjoyed were mussels in a tantalizing garlic wine broth and loads of surreal fried calamari. As we watched the sunset at dinner, we felt like this was an excellent introduction to what the Greek isles had in store for us the next few days! 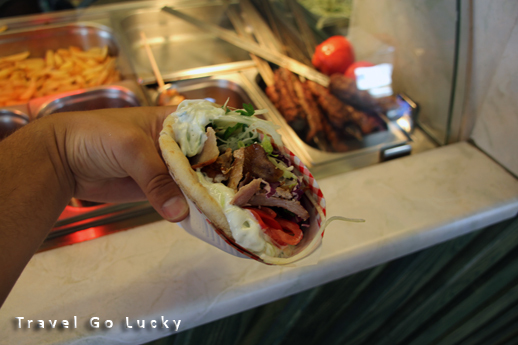 Chances that you can find a gyro this good back home? ZERO Percent. The Korallis salad.... aka... THE GREATEST SALAD IN THE WORLD. Looks like total fun. Wish I could join you on a leg of the trip. (Hint) Maybe, just maybe I will get the courage to do that. You guys are the best. Really!?!? You just tell us where you’re interested in and we can take care of you from there… and seriously, you are the best. Couldn’t have done this trip without you! I came across this blog through a “PROFILE UPDATE” on my linkedin. Extremely happy I checked it out! My girlfriend, my sister, and I continually stop by this blog as the duration of time traveling, the places, the pictures (Excellent! ), and well written posts are all very interesting. Very cool you had the chance to do this. I’ve enjoyed reading your blog from 4am-5am this morning! Bless you two! Congrats on Your Engagement! !